Martha Teichner is a correspondent for “CBS News Sunday Morning” and recipient of numerous Emmy Awards for her reporting. 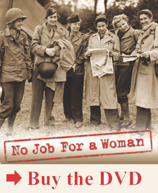 Teichner appears in “No Job For a Woman”: The Women Who Fought to Report WWII. Please see Teichner describe reporting a conflict in South Africa.